Johnson, Paul. Diaspora conversions : Black Carib religion and the recovery of Africa. Berkeley: University of California Press, 2007. By joining a diaspora, a society may begin to change its religious, ethnic, and even racial identifications by rethinking its “pasts.” This pioneering multisite ethnography explores how this phenomenon is affecting the remarkable religion of the Garifuna, historically known as the Black Caribs, from the Central American coast of the Caribbean. It is estimated that one-third of the Garifuna have migrated to New York City over the past fifty years. Paul Christopher Johnson compares Garifuna spirit possession rituals performed in Honduran villages with those conducted in New York, and what emerges is a compelling picture of how the Garifuna engage ancestral spirits across multiple diasporic horizons. His study sheds new light on the ways diasporic religions around the world creatively plot itineraries of spatial memory that at once recover and remold their histories. Adderley, Rosanne. “New negroes from Africa” : slave trade abolition and free African settlement in the nineteenth-century Caribbean. Bloomington: Indiana University Press, 2006. In 1807 the British government outlawed the slave trade, and began to interdict slave ships en route to the Americas. Through decades of treaties with other slave trading nations and various British schemes for the use of non-slave labor, tens of thousands of Africans rescued from illegally operating slave ships were taken to British Caribbean colonies as free settlers. Some became paid laborers, others indentured servants. The encounter between English-speaking colonists and the new African immigrants are the focus of this study of the Bahamas and Trinidad—colonies which together received fifteen thousand of these “liberated Africans” taken from captured slave ships. Adderley describes the formation of new African immigrant communities in territories which had long depended on enslaved African labor. Working from diverse records, she tries to tease out information about the families of liberated Africans, the labor they performed, their religions, and the culture they brought with them. She addresses issues of gender, ethnicity, and identity, and concludes with a discussion of repatriation. Diouf, Sylviane. 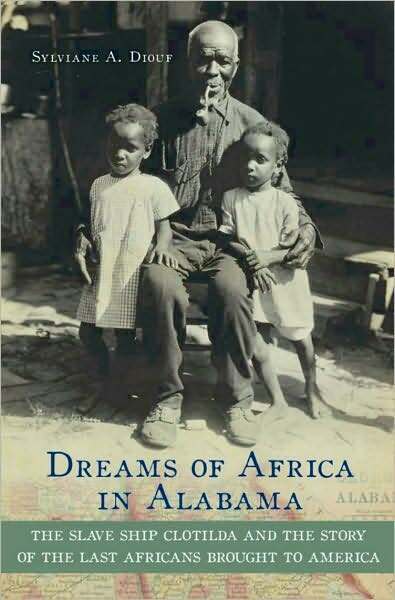 Dreams of Africa in Alabama : the slave ship Clotilda and the story of the last Africans brought to America. New York, NY: Oxford University Press, 2007. On a January night in 2002, a truck backed up to a statue in front of Union Missionary Baptist Church, north of Mobile, Alabama. One or two people got out, cut through parts of the heavy bronze bust, ripped it from its brick base, and disappeared with their loot. The theft shocked and angered the congregation of pastor A. J. Crawford, Sr. They had just celebrated the New Year and were preparing to commemorate, the following month, the 130th anniversary of the church. Unlike those of the Virgin Mary or George Washington, this statue was the only one of its kind in the country. The theft struck at the very core of a community that will never have any equivalent in North America. Determined to bring the statue back home, the congregation established a reward fund. In case the bust was not found, the money would be used to cast a new one. The wooden model, carved fifty years earlier, was still in town. The statue dated back to 1959, when a steel shaft was sunk 100 feet into the earth in front of the church, to commemorate the one hundred years that had passed since the honored man and his companions had set foot on Alabama soil. The bust and the shaft were the symbols of an exceptional tale. In the summer of 1860, less than a year before the outbreak of the Civil War, one hundred and ten young men, women, and children were brought to the Alabama River, north of Mobile. They had just spent six weeks onboard the Clotilda, a fast schooner that had brought them from a world away. They were the last recorded group of captive Africans brought to the United States. Acting for Timothy Meaher, one of the most prominent businessmen in Mobile, Captain William Foster had smuggled them in under cover of night. He had to be careful because decades earlier, on January 1, 1808, the country had abolished the international slave trade. Although tens of thousands of Africans had since landed, the slavers could, in theory, be hanged. After emancipation, the young people tried to get back home but, unable to do so, they eventually bought land and founded their own town. One of their first major enterprises was the construction of a church. Cudjo Lewis used to ring the bell. One hundred and thirty years later, it was his bronze bust that was stolen from in front of the brick building that had replaced the white clapboard church erected by the men and women of the Clotilda. Cudjo did not belong to a distant past: he lived through World War I, Garvey’s Back to Africa Movement, the Great Migration, and the Great Depression. He died in 1935, the last survivor of the last slave ship. Cudjo and his companions were part of a tiny group of people born in Africa who witnessed the Civil War, Reconstruction, and the early decades of the twentieth century. To these men and women in their eighties and nineties living in the Jim Crow South, the Middle Passage was still a painfully vivid memory. The Wesley-Logan Prize jointly sponsored by the AHA and the ASALH for an outstanding book on some aspect of the history of the dispersion, settlement, and adjustment, and the return of peoples originally from Africa. This award was established in 1993 and will be awarded annually.